Distance has been developed by a team of statisticians, ecologists and computer scientists for institutions around the world. Rather than e-mailing individual team members when asking questions, please consult our Get in Touch page. Len Thomas is a professor of statistics with the Centre for Research into Ecological and Environmental Modelling (CREEM) at the University of St Andrews. He is the coordinator of the Distance project. Jeffrey L. Laake is a statistician at the National Marine Mammal Laboratory in Seattle, USA. Eric Rexstad is a senior research fellow within CREEM at the University of St Andrews. Stephen T. Buckland holds the Chair in Statistics in the School of Mathematics and Statistics at the University of St Andrews. David L. Borchers is a professor of statistics in the School of Mathematics and Statistics at the University of St Andrews. Tiago A. Marques is a senior research fellow within CREEM at the University of St Andrews. Laura Marshall is a post-doctoral research fellow within CREEM at the University of St Andrews. David L. Miller is a post-doctoral research fellow within CREEM at the University of St Andrews. 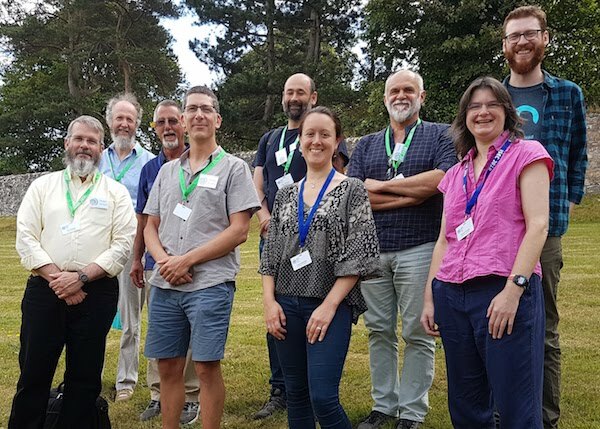 Distance Development team at the International Statistical Ecology Conference, St Andrews, Summer 2018. Back row, left to right: Steve Buckland, Jeff Laake, Tiago Marques, David Borchers and Dave Miller. Front row, left to right: Eric Rexstad, Len Thomas, Laura Marshall and Rachel Fewster. Distance Development team at the International Statistical Ecology Conference, Montpellier, Summer 2014. Left to right: Steve Buckland, Eric Rexstad, David Borchers, Len Thomas, Laura Marshall, Tiago Marques and Dave Miller. Not pictured Jeff Laake. Photographer: Rachel Fewster. 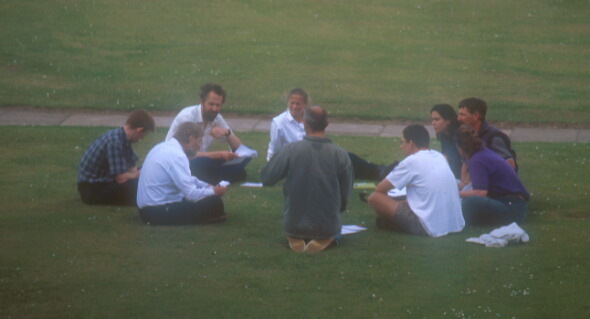 Distance Development team in a meeting, Summer 2001. Left to right: John Pollard, Ken Burnham, Steve Buckland, Sharon Hedley, David Borchers, Len Thomas, Fernanda Marques, Jeff Laake, Samantha Strindberg. David Anderson, Eric Rexstad and Jon Bishop are absent; Tiago Marques is behind the camera.